We arrived at the Zagreb airport after traveling for about 25 hours. After claiming our baggage and proceeding through customs and immigration, we asked about transportation to the hotel. The nice lady at the information desk told us that we could take the bus to the downtown bus station and then take the Number 6 tram to our hotel. The bus would cost 30 kuna (about $6) each and it left every half hour. We exchanged some dollars for kuna and went outside to wait for the bus. After waiting about 15 minutes, we decided to find out how much a cab to would cost. We asked the cabbie at the head of the line how much it would cost to take us both to our hotel and he replied, "20 kuna" - which, after traveling for 25 hours, seemed to make sense so we threw our bags in the trunk and we were off to the hotel. Upon arrival, we asked him, "20 kuna?" and he replied, "it's a little more - 200 kuna", about $40 US. (we later learned that 20 kuna was the "drop charge" and typical cab fares from the airport to downtown were 150 to 180 kuna). After a quick clean-up, we headed out to take a look at Zagreb and find a place for dinner. 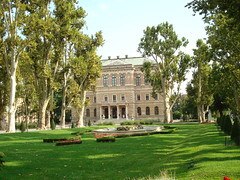 Downtown Zagreb is a bustling and vibrant place, much like other European cities. The city is clean and the people are friendly and helpful, but almost immediately we noticed an abundance of graffiti. After strolling through the Donji Grad district and looking at a number of sidewalk cafes and coffee bars, we opted for a couple of slices of pizza at a local shop. 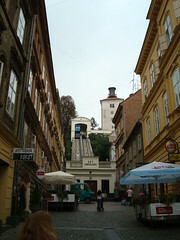 On Wednesday we set to out to explore the oldest part of Zagreb - the Upper City. After walking up to the ﻿Uspinjača, we discovered yet another transportation challenge: the ﻿Uspinjača was shut down for repair. Undaunted, we climbed the stairs and enjoyed the views of the city on the way up. Our first stop was St. Mark's Church. 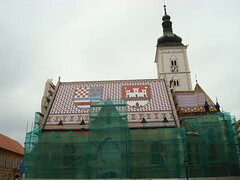 While the exterior of the church was under renovation, we would see the famous tile roof. Just down the street is the Stone Gate, one of the entrances to the old city. At one point, a fire destroyed much of the gate except for a portrait of the Virgin Mary which the locals took as a sign. 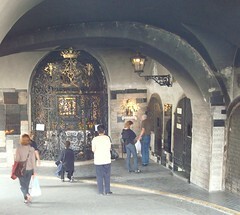 Today the gate is a shrine with pews and a lady selling candles. The walls are covered with small plaques offering thanks. 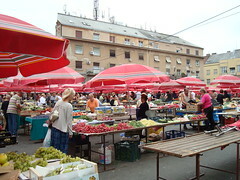 We next stopped at the large farmers' market located in Kaptol Square and purchased plums and grapes from some of the local vendors. After wandering around the old city a little more, we stopped for lunch at one of the restaurants. Leslie was in the mood for beef so she ordered chateaubriand. I was in the mood for something lighter, so I tried to order sausages and a salad. When I asked for sausages, the waiter said "no" and then something about "chateaubriand". Thinking that he misunderstood and thought that we both wanted chateaubriand I tried again. The waiter then pointed to each item on the menu saying "yes" at each until he got to "sausage" whereupon he said "no". Ah, they're out of sausages. Once again the waiter said something about "chateaubriand" and pointed to both of us. I said "no" and ordered a mushroom risotto. When the food came, there was a platter with two large pieces of chateaubriand. We spent the rest of lunch wondering if he had brought us two orders of chateaubriand but when the check came, there was only one. Another surprise was a shot of slivovitz which appeared at the end of the meal. We thought that perhaps it was a congratulatory drink for eating all the food or a goodwill gesture for the difficulties while ordering, but it too was on the bill. Our last stop for the day was the Zagreb office of Plitvice Lakes National Park. We stopped in to find out about transportation to the park as our lodging the next night was just outside the park boundary. We were told that transportation would not be a problem as there was a shuttle that ran from the camp to the park. The lady at the desk also marked up a bus schedule with the name of the village where we should ask to be let off to get to the campground.